The supply and demand of serviced apartments in Europe has continued to grow year on year and promises to continue its steady growth into 2018 and beyond.PREM Group is embracing the change from full-service hotels to a more flexible, self-catering option. PREMIER SUITES offer an alternative to a traditional hotel stay with added space, more independence and better value for money.PREM Group is an international property management company established in 1996 and operating over 45 hotels across 5 European countries. They offer everything from budget city centre accommodation to serviced apartments and luxury country estates. 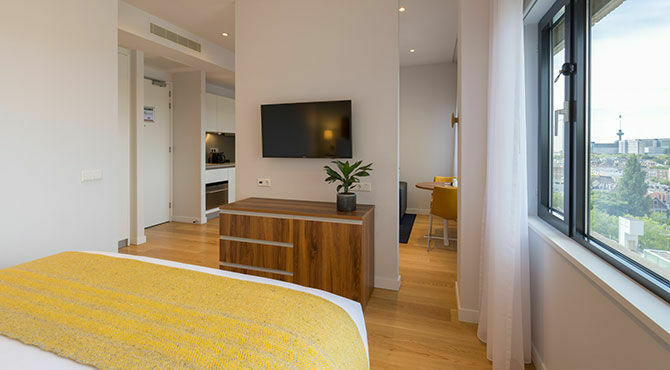 Rotterdam has some of the best connections in the Netherlands and with the Port of Rotterdam developing and expanding each year, Rotterdam was a fantastic choice for PREM Groups next property.In June 2017 PREMIER SUITES PLUS Rotterdam opened its doors. Located in the city centre of Rotterdam, opposite Central Station and less than 15-minutes’ drive from the Port, it is perfect for all types of travellers. With most of its buildings destroyed in the 1940’s rather than reconstruct in the traditional style, the city council opted to recreate the city in a modern and spacious way.Rotterdam is now one of the most progressive and architecturally impressive cities in the Netherlands. Overblaak Development and De Rotterdam are prime examples of some of their ingenious designs. As well as having the biggest port in Europe on its shores, Rotterdam is home to many renowned scientific institutions and a thriving international business community.It’s location on the edge of Europe makes it easy to travel to, the closest airport being The Hague Airport or Amsterdam Schiphol – both approximately 30-minutes by train to PREMIER SUITES PLUS Rotterdam. Rotterdam is brimming with museums, art galleries, bars and restaurants. Markthal Rotterdam, Netherlands largest indoor food hall is a 15 minutes walk to PREMIER SUITES PLUS Rotterdam and serves some of the best international and local cuisine available.Museum Boijmans Van Beuningen plays host to some of the world’s most renowned artist’s work. From Van Gogh to Dali, there is something for everyone. Why choose PREMIER SUITES Serviced Apartments? PREMIER SUITES are going from strength to strength and have recently won an award from the Association of Serviced Apartment Providers (ASAP) for Best Guest Experience in late 2017. 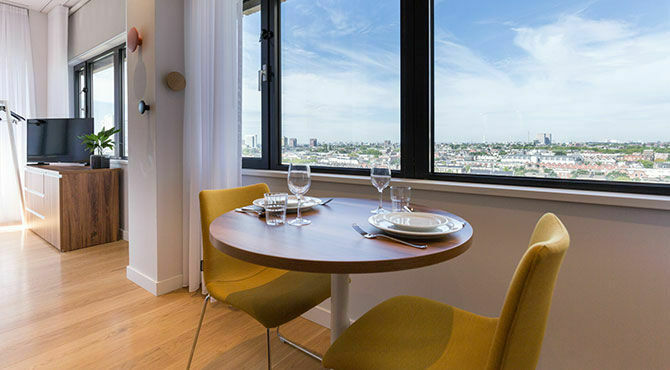 PREMIER SUITES PLUS Rotterdam is located in the highly desirable business district, opposite Central Station which is perfect for travel to and from the airport or further afield. Their central location is ideal for exploring the city, with all main attractions within walking distance. The property is surrounded by trendy bars and restaurants. Serviced apartments are a welcome change from a traditional hotel stay offering much more space and flexibility while retaining the style and modern facilities of a 4-star hotel.They offer a relaxed place to live and work while feeling settled, safe and secure. Having access to a private kitchen gives culinary flexibility not available when staying in a hotel, so you decide what and when you eat without the restriction of restaurant times and menus.We provide everything you need to prepare exactly what you want to eat, including all crockery and cutlery, a microwave, toaster, dishwasher and combi oven. You have the option to enjoy a leisurely breakfast in the comfort of your own lounge and start your day with a complimentary coffee from your personal Nespresso machine. Serviced apartments offer a cost-effective alternative to hotel rates. Eliminate costly restaurant bills and enjoy one or all of your three meals a day in the comfort of your own kitchen and living space.PREMIER SUITES PLUS Rotterdam offers a variety of special offers and corporate rates determined by your length of stay with the discount increasing the longer you stay so you are guaranteed the best value for money. When making a booking for any accommodation it is always better to book directly on the official website and cut out the middleman.Booking agents take a large commission payment which neither the property or guest benefit from. PREMIER SUITES PLUS Rotterdam makes it easy for you to book direct and offer a variety of benefits when you do so. Here’s why you should always book directAccess to exclusive discounts, guaranteeing you are getting our best available rate each time you book with an additional 5 per cent off any of our competitor’s rate when you book online and use the code SAVE5.Website only special offers: book on the official website for access to seasonal and year-round discounts such as the Winter PackageEnjoy a welcome gift each time you book direct. Complimentary use of a bathrobe and slippers are included for the duration of your stay.See real rewards from our loyalty club. Rewards from us to you is an extra thank you to loyal guests. Collect points each time you stay and use them to collect gift cards for Amazon, iTunes and many more.PREMIER SUITES are planning further European openings in the coming years, a second location in Glasgow, Scotland in summer 2018, Antwerp in September 2018 and Amsterdam in 2019.Visit our website if you would like to book a stay in PREMIER SUITES PLUS Rotterdam or for more information on special offers.